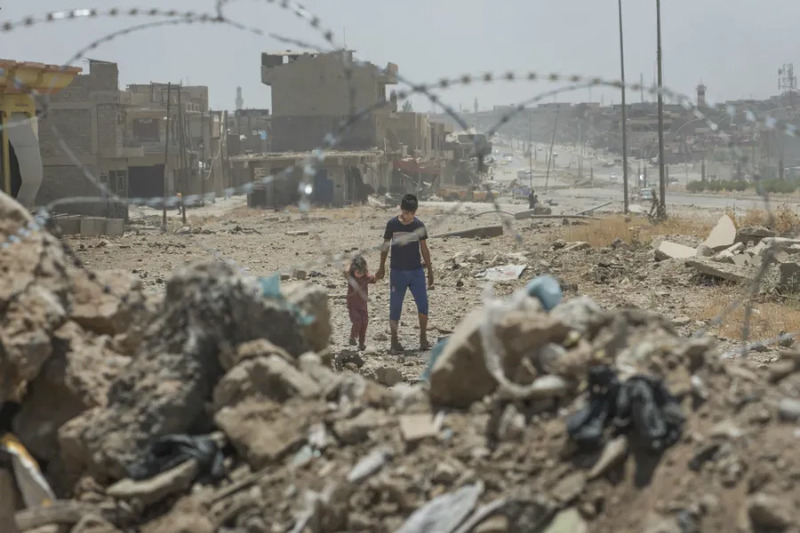 Rome, Italy, Jul 14, 2017 / 12:08 am (CNA/EWTN News).- Just days after Iraqi forces completed their recapture of Mosul from the Islamic State, the nation’s ambassador to the Holy See has said that they are eager to rebuild the city and have people return home, but it will require help to do so. “We reiterate our need for greater cooperation and greater help for the reconstruction and stability of the freed areas, including Mosul, because there is no complete victory until the displaced are returned to their homes and guaranteed essential services,” Omer Ahmed Karim Berzinji said July 13. Berzinji spoke to journalists at a press conference in Rome July 13. The presser was held in response to the July 9 declaration that Mosul had been recaptured. The government operation to free Mosul, one of the Islamic State’s remaining key strongholds, had been underway for nine months. The group still controls areas around the Iraqi cities of Tal Afar, Hawija, and Al-Qa’im, as well as portions of Syria. During this time, thousands were killed and nearly 1 million residents fled the city, the major part of it destroyed. Fr. 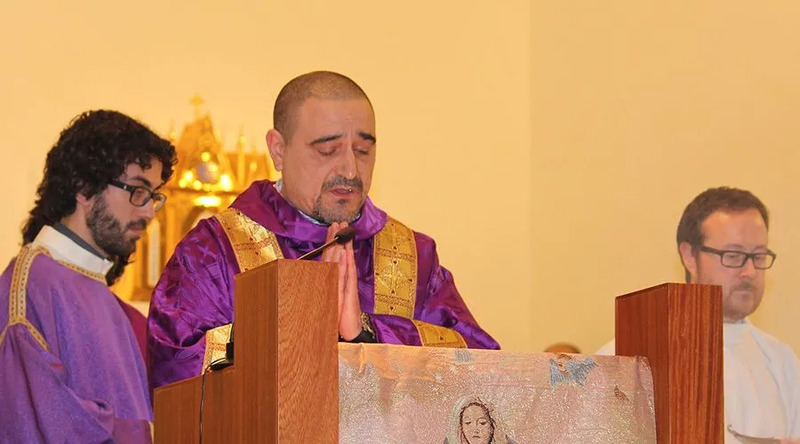 Ghazwan Baho, a parish priest in Alqosh – the last major Christian city on the Plain of Nineveh not taken by the Islamic State – told CNA they are thankful Mosul has been freed, but the future of the city is still uncertain. The Islamic State had controlled Mosul, Iraq’s second largest city, since June 2014. It has imposed a rigid version of sharia in territory it controls, but its rule also features arbitrary violence, including killing and enslavement. A 2016 U.N. report said that 800 to 900 children in Mosul have been abducted and put through Islamic State religious and military training. There have been accounts of child soldiers who were killed for fleeing fighting on the front lines of Iraq’s Anbar province. The U.N. also estimates that as of Jan. 2016 the group held about 3,500 slaves, mainly women and children of the Yazidi religion. Some of the women are killed for trying to escape or for refusing sexual relations with Islamic State fighters. “I am very enthusiastic to take all of that (remaining) occupied territory,” he continued. 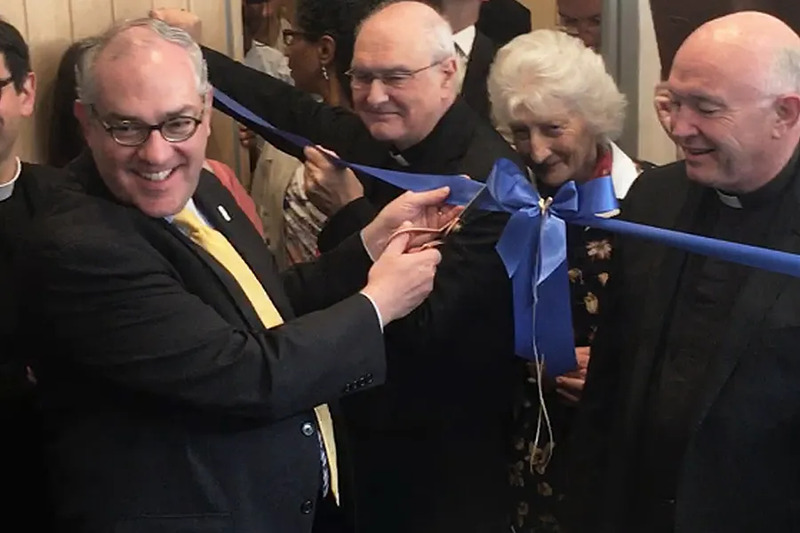 Norwich, England, Aug 29, 2017 / 02:24 pm (CNA/EWTN News).- On Tuesday EWTN opened its first studio and office in the U.K. at the Shrine of Our Lady of Walsingham, emphasizing its role in supporting the Church’s evangelization in the region. In an Aug. 29 statement on the studio launch, EWTN Chairman and CEO Michael P. Warsaw called the opening of the facility “a particularly important” step for the network’s continued development in the U.K. Located in a converted house in the village of Walsingham, about 30 miles northwest of Norwich, the studio includes a street-level reception area and welcome center for visitors, where pilgrims can watch clips of EWTN’s most popular television shows, films, and documentaries. One of the most important pilgrimage sites in Europe, the Walsingham shrine dates back to 1061, and is widely referred to as “England’s Nazareth.” Both Anglican and a Catholic chapels are located at the site, which has become a hub for ecumenical prayer and devotion. Inspiration for the shrine came when a devout English noblewoman, Richeldis de Faverches, prayed to undertake a special task in honor of Our Lady. As the story goes, in answer to the woman’s request, Mary appeared to her in a vision and took her to Nazareth, showing her where the Annunciation occurred. Mary then asked De Faverches to build a replica of the house in Walsingham to serve as a perpetual memorial of that moment. The shrine was built and a religious community put in charge of it. In 1150, a priory was built by the Augustinian Canons, and eventually Walsingham became one of the largest, most well-known shrines in Medieval Christendom. However, during the English Reformation, the priory was handed over to the commissioners of King Henry VIII in 1538, and the highly venerated statue of Our Lady of Walsingham was burned along with the shrine. As a result, pilgrimages to the site ceased, and wouldn’t pick up again for another 300 years, until after the Catholic Emancipation of 1829. In 1896, Charlotte Pearson Boyd purchased a small, 14th century chapel called the “Slipper Chapel” – one of the last en-route to Walsingham – and restored it for Catholic use. A year later, in 1897, Leo XIII issued a rescript stating that the shrine of Our Lady of Walsingham would be restored. 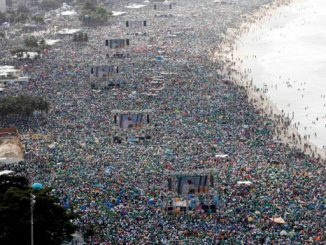 Official pilgrimages started up again that same year, and visits to the site increased as greater numbers of pilgrims began filing into both the chapel and the shrine for devotion. Walsingham currently attracts some 150,000 pilgrims during peak seasons. In 2015, on the Feast of the Holy Family, Pope Francis gave the shrine the title of a minor basilica. Present alongside Warsaw at the ribbon-cutting ceremony for the new shrine was the shrine’s rector, Monsignor John Armitage, and Bishop Alan Hopes of East Anglia. “EWTN right at the front of evangelization in the media…it enters people’s hopes, it enables them to join in the prayer and worship life of the Church,” he said. “It means that people can see the teaching aspects of the faith, so it’s a real mission in itself. Cardinal Vincent Nichols of Westminster sent a letter for the occasion, which was read aloud by Bishop Hopes at the ceremony. “In this new chapter of its history, I welcome the opportunity for the shrine and EWTN to work together as servants of the New Evangelization,” he said, adding that he is looking forward to visiting the studios himself while in Walsingham for the Westminster pilgrimage in October. All television and radio channels EWTN produces for the U.K. and Ireland are currently available on the Sky satellite platform, and cable and video streaming platforms throughout the area. The network also transmits two additional television channels for the European continent. The Walsingham studio in particular was made possible thanks to the work of Saint Clare Media-EWTN, Ltd., the network’s non-profit affiliate in Britain. They conduct marketing, fundraising, and the production of programming for EWTN’s radio services in the U.K., and they are also create and distribute news content in collaboration with EWTN’s global news outlets. Warsaw joined EWTN in 1991 and worked in senior management positions in television production, satellite operations and technical services. In 2000 he became president of EWTN, and in 2009 he assumed the post of CEO. In 2013 he was named chairman of the board. EWTN was founded launched in 1981 by Mother Angelica of the Poor Clares of Perpetual Adoration. The largest religious media network in the world, it reaches more than 268 million television households in more than 145 countries and territories. In addition to 11 television channels in multiple languages, EWTN platforms include radio services through shortwave and satellite radio, SIRIUS/XM, iHeart Radio, and over 500 AM and FM affiliates. EWTN publishes the National Catholic Register, operates a religious goods catalogue, and in 2015 formed EWTN Publishing in a joint venture with Sophia Institute Press. Catholic News Agency is also part of the EWTN family. Oviedo, Spain, Mar 14, 2018 / 01:24 pm (ACI Prensa).- Alberto José Gonzalez is a 50-year-old retired police officer, married with two daughters, who recently began his ministry as the first permanent deacon in the Diocese of Gijón, Spain. Whether it is in the National Police Force or as a member of the clergy, “a service is provided to the people and that is precisely my vocation,” he told the newspaper El Comercial. After some health problems prevented him from continuing his work as a policeman, he decided to take an early retirement. It was while he was on sick leave that the possibility of becoming a permanent deacon matured. Key to his discernment was an “intense conversation” with a priest who had experienced a conversion and been ordained following a life of drug use far from the Church. Gonzalez retired from the National Police Force in August 2011. In September that same year, he enrolled in the San Melchor de Quirós Higher Institute of Religious Studies in Oviedo, Spain where he studied for three years. He was ordained on Dec. 13 last year, along with two other men who had studied alongside him – one to the permanent diaconate and the other to the transitional diaconate. Deacon Gonzalez explained to El Comercial that he can preach, administer Baptism, bring Viaticum to the sick, and officiate at weddings and funerals, but he stressed that what he likes the most is relating to people. “After all, that was what I liked the most during my time in the National Police Force. I don’t deny that the car chases and making traffic stops were [exciting], but what always stayed with me were the words of thanks from the people I helped and the good friends I made throughout that time,” he said. The diaconate is one of the three degrees of Holy Orders. The word “deacon” mean “he who serves.” The mission of the deacon is to serve the bishop and his priests in the liturgy, with preaching the Gospel, and performing works of charity. The minimum age is 35, and the upper limit is determined by the local bishop, usually around 60 years of age. Unlike the transitional diaconate, in which men are preparing for priesthood, the permanent diaconate allows married men. They must be married for at least five years and have their wife’s consent. If they are later widowed they may not marry again. Dublin, Ireland, Aug 27, 2018 / 12:24 pm (CNA).- Despite generations of poverty and prejudice from both the government and ordinary Irish citizens, the faith of the itinerant Irish Traveller community today is strong, say local Catholic leaders. Lawrence Hall: "Eternal rest grant unto him, O Lord, and make perpetual Light to shine upon him." Leon Berton: Requiescat in pace Christi.